Scar tissue formation is part of the normal healing process after back surgery. While scar tissue can be a cause of pain, actual scar tissue pain is very rare since the tissue contains no nerve endings. Rather, the principal mechanism of pain is thought to be the binding of the lumbar nerve root by fibrous adhesions, called epidural fibrosis. Postoperative stretching exercises can help decrease the effects of postoperative scarring around the nerve root. All patients will heal with scar tissue after back surgeries as this is the only way to heal. The reality is that although scar tissue is often clinically the reason given for continued pain after surgery, it is probably rarely the cause of postoperative pain. 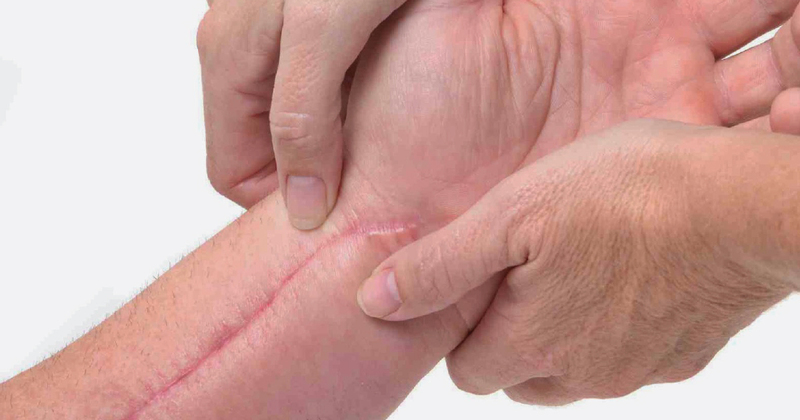 Particularly in patients that have similar pain postoperatively to what they had before surgery, it is unlikely that the addition of scar tissue has any clinical relevance. The one time that scar tissue (epidural fibrosis) may be symptomatic is for a patient who initially does well after a lumbar discectomy or a decompression, only to have recurrent pain come on slowly between 6 to 12 weeks after surgery. This is the time period that scar tissue takes to form, and as it forms it can cause the nerve root to become adherent within the spinal canal. Keeping the nerve moving through stretching exercises can help prevent this scenario. Pain that starts years after surgery, or pain that continues after surgery and is never relieved, is not from scar tissue.